Tesla Mass Super Charger – Advanced Muscle Mass Gainer increase muscle size! More protein, Better calories, Bigger results. 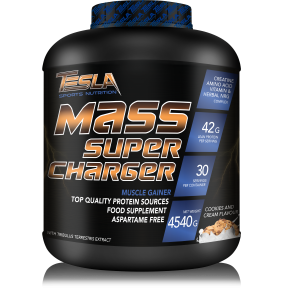 Tesla Mass Super Charger is an advanced muscle mass gainer designed for any individual that has a tough time adding size, is in their bulking phase, and/or wants to break through their strength plateaus. Tesla Mass Super Charger delivers 42g of protein per serving. The multi-phase protein system supplies fast, medium, and slow-digesting proteins providing critical amino acids to the body at varying speeds. 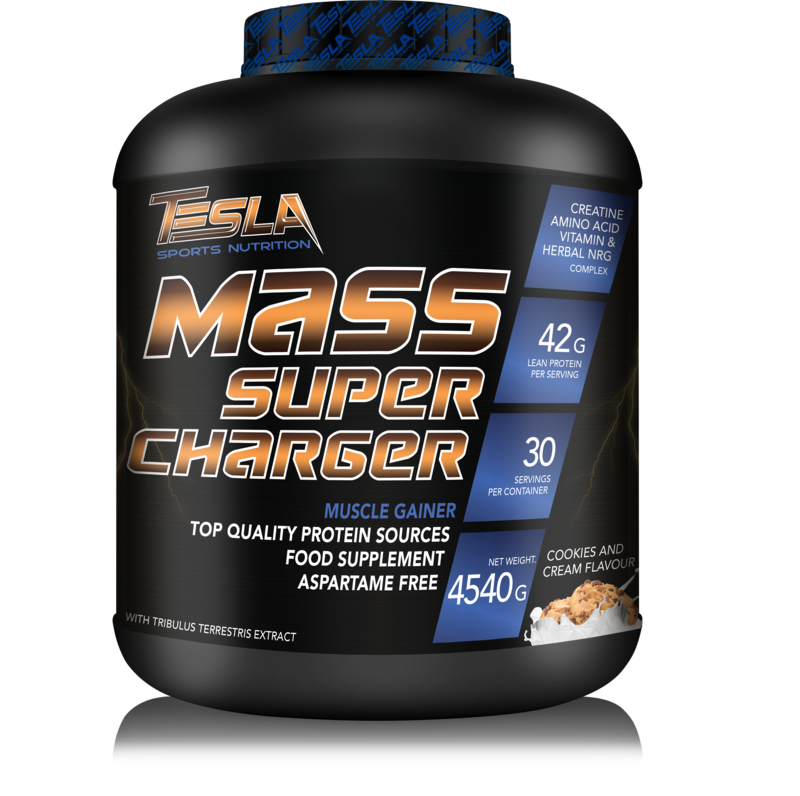 The new, powerful formula Tesla Mass Super Charger now delivers a massive 620 calories derived from high-quality protein and quickly digested carbohydrates, as well as specialized fats. It is the most versatile weight gainer available, which can be taken once daily or split into two separate half servings. The formula Tesla Mass Super Charger delivers L-Isoleucine 5464 mg of BCAAs,L-Leucine (BCAA)10401 mg L-Valine (BCAA)5912 mg and 5 grams of Leucine, which help fuel your skeletal muscles, preserve muscle glycogen stores, and help to reduce the amount of protein breakdown. Supplies 132g of carbohydrates through a multi-phase carb complex to both spike insulin within a normal range, quickly shuttling creatine into the muscle, and promote muscle glycogen replenishment, helping to put the body into an anabolic state. Tesla Mass Super Charger provides L-Glutamine 500 mg,L-Arginine 300 mg,L-Citrulline DL-Malate 100 mg which,Taurine 100 mg. It has even been noted to play a role in glucose production for usable energy.